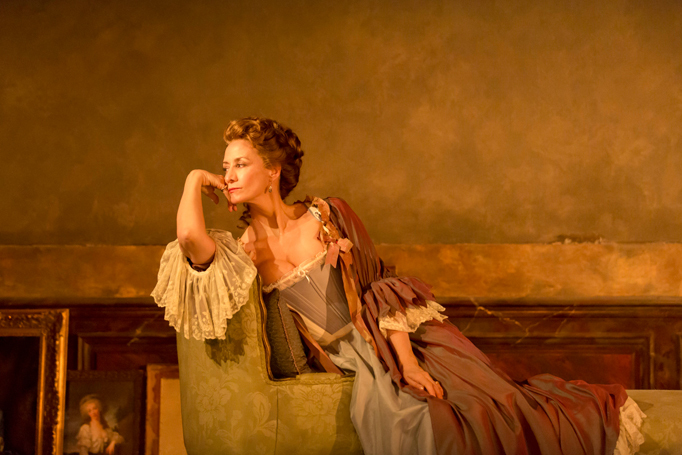 Christopher Hampton’s ever-intriguing play Les Liaisons Dangereuses is given a classy revival at the Donmar Warehouse, where the intimacy of the tiny auditorium immerses the audience in the great salons of 18th century France. Am I the only one who approaches a viewing of the play by identifying the film counterparts of each performer? In this production, celebrated actress Janet McTeer plays the wickedly manipulative La Marquise de Merteuil (played by Glenn Close in the 1988 movie), Dominic West has the John Malkovich role, the odious Le Vicomte de Valmont, Elaine Cassidy is the virtuous Madame de Tourvel (Michelle Pfeiffer), Morfydd Clark is innocent young Cécile (Uma Thurman), Adjoa Andoh plays her mother, Madame de Volanges, and talented newcomer Edward Holcroft is the petulant youth Le Chevalier Danceny (Keanu Reeves). Tom Scutt has designed a large salon setting, gilded yet slightly aged, which represents each location with a few changes of furniture by the servant ensemble members. Angelic female voices raised in song smooth these scenic transitions. Touches of quality include the rich dark oak herringbone floor and the five chandeliers with burning candles. A large painting showing a debauched scene of nudes sets the scene for the predilections of the characters. 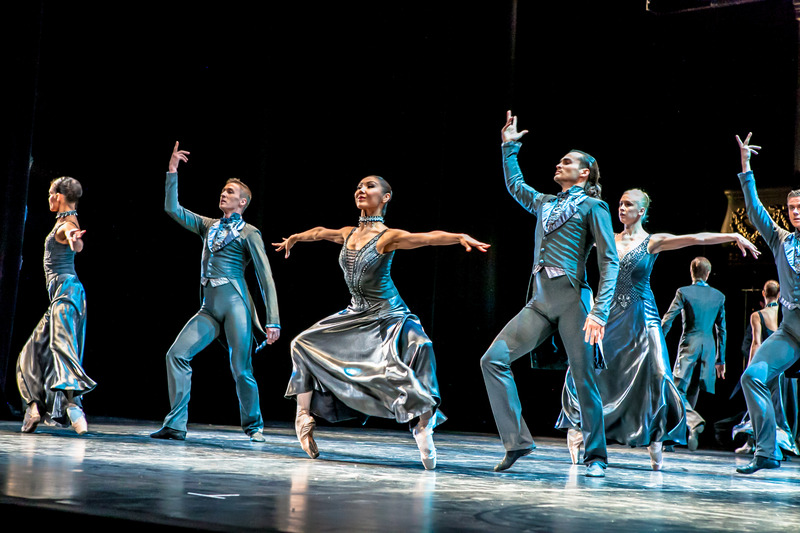 Scutt’s costumes are exceedingly handsome, yet have a muted, realistic look, rather than the heightened, pristine look often seen on stage or screen. Josie Rourke’s direction keeps the dialogue delivery at a pacy clip, with speech delivered in natural, everyday tones. While this choice greatly aids accessibility, there is a slight loss in the sense of class and distinction in the characters. The exception to this is the wonderful central performance of McTeer, who manages the natural speech patterns but has a delightfully plummy, imperious tone. 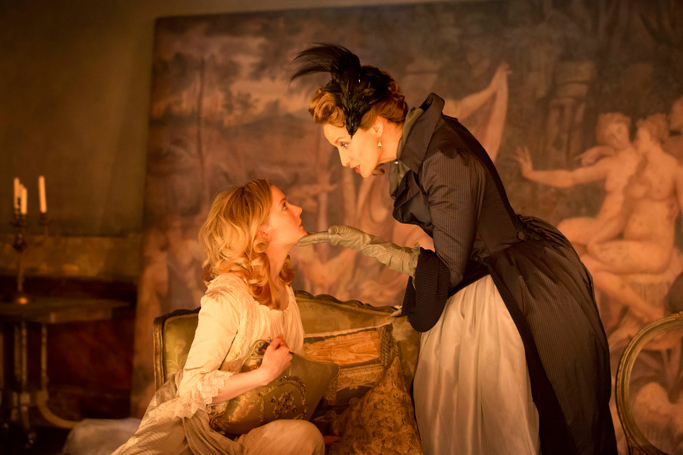 McTeer conveys the duplicitous nature of the Marquise successfully and deliciously, also landing moments of searing pain as the vindictive woman’s schemes bring her heartache of her own. 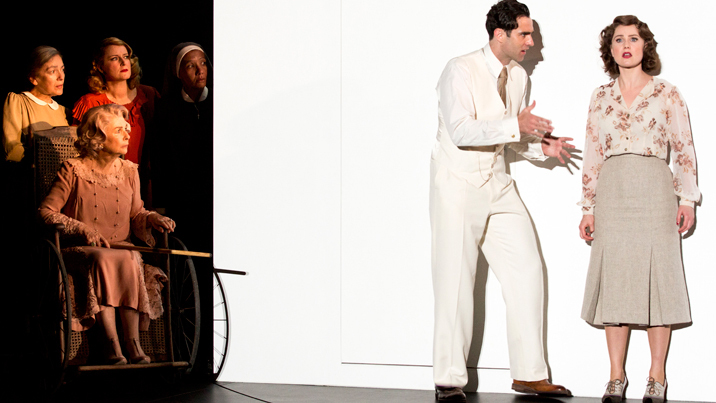 West has a particularly down to earth manner and tone of voice that do not support the Vicomte’s standing in society. Playing one of literature’s most morally deviant villains, West does not convey the wicked delight and slimy seductiveness that the role requires; his Vicomte seems an everyday bloke rather than a viable match for La Marquise. 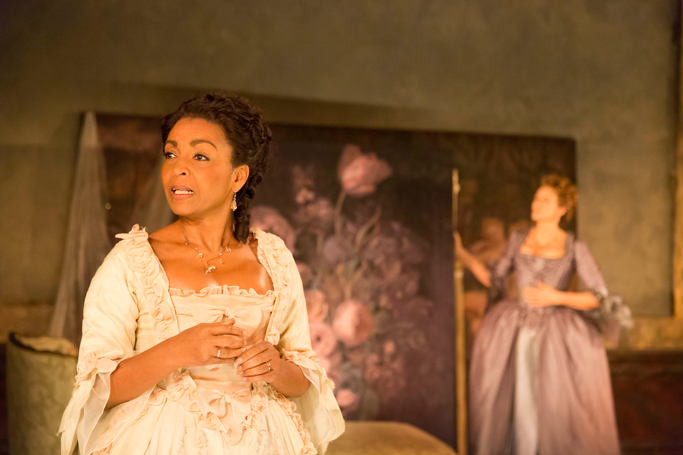 Cassidy begins with an understated presence as Madame de Tourvel, making it hard to see why the Vicomte is so keen on conquering her virtue. As events of act two transpire, Cassidy melts Tourvel’s defences and unleashes her desires, bringing out the best in West in their scenes. Clark is a fresh and lovely Cécile. Andoh gives Volanges the wily look of a mother who is always on high alert. Una Stubbs is priceless as Valmont’s dear aunt, Madame de Rosemonde. 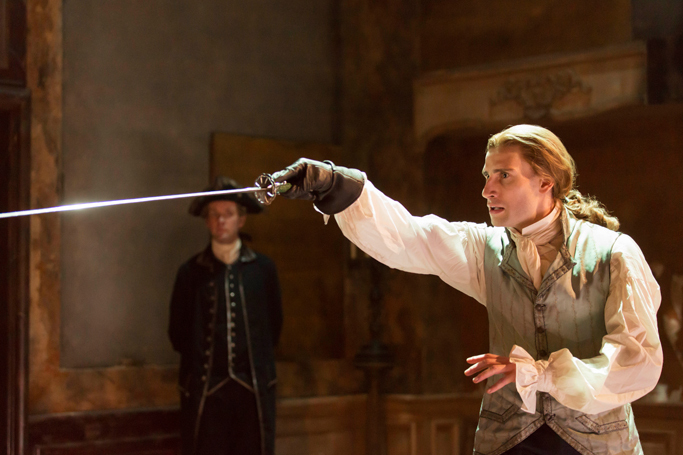 Holcroft successfully masks his crisp good looks and masculine physique to play a foppish, romantic boy. This is a case of the whole being greater than the sum of the parts, in that any hesitation over individual performances is offset by the overall strength of the production, which is in no small part due to the quality of the play in the first place. 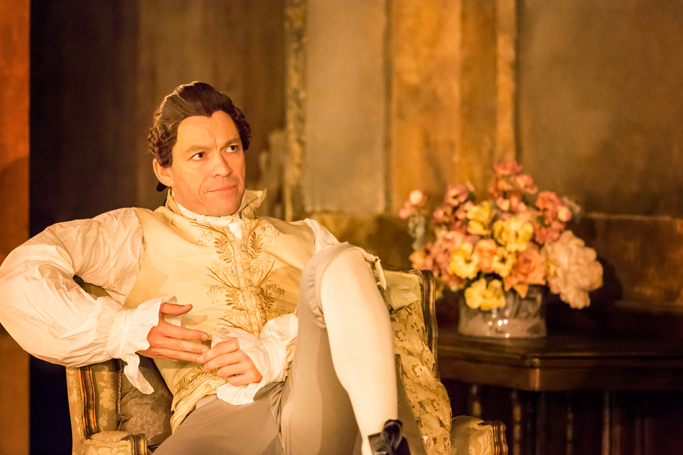 Les Liaisons Dangereuses plays at Donmar Warehouse, London until 13 February 2016. 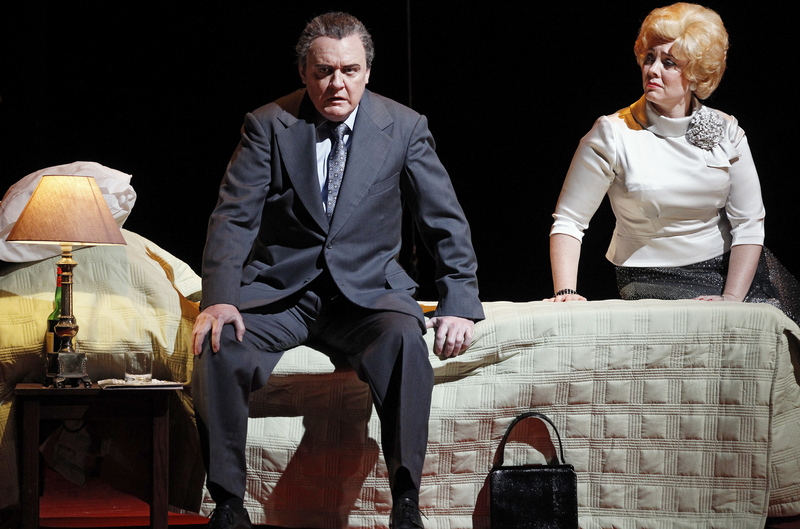 It will be broadcast to cinemas as part of NT Live on 28 January 2016. 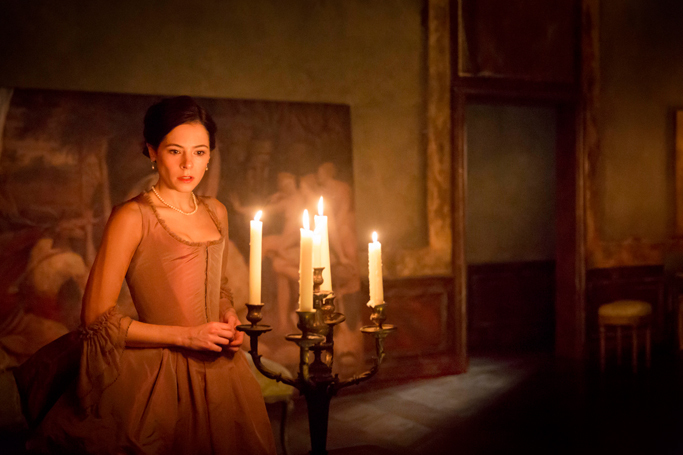 Les Liaisons Dangereuses was reviewed 7.30pm Friday 22 January 2016.